What are best hairstyles for a round faces, a curly or straight hairstyle? I love your site, and I’d really appreciate any help you could give me for my current hair worries –I’ve got a round face shape, and my (dark brown) hair tends towards lots of curls and volume. I’ve tried out a bunch of different professionally-done high lighting at a series of hair salons, and every time, I keep getting the impression that when my hair is curly, they almost look stripe-y. When I straighten my hair, the effect is gone. (A) Is this a common curly-headed problem?, and (B) Should I leave my hair curly at all? Between my high lighting troubles and the volume emphasizing my round face shape, I’m wondering whether I should consider all straight, all the time? (Maybe you have some alternate miracle hair styling tip — I don’t want the daily straightening to damage my hair!) Thanks for this valuable site! I think with Katie’s curly, voluminous hair, she’ll find it much more flattering hairstyles for round faces to tone down her curls. The most important consideration in Finding the right hairstyle for any woman, is, . . . face shape . . . face shape . . . face shape. If you have a round face, your face has soft, full contours with a rounded jaw and chin line. You’ll want to avoid hairstyles with bangs. Your hairline may be softly rounded as well. Also, your face shapeRight Hairstyle for Round Faces Can Really Make a Difference is more symmetrical; the width and length of your face are approximately the same. Your face gives the appearance of being more symmetrical. For some reason, every woman who thinks she has a round face shape, thinks she is cursed! Grant it, a wrong hairstyle on a round face shape can be kinda . . . well, discouraging. 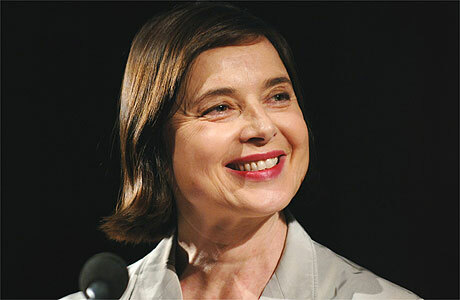 But as you can see from the picture of my favorite celebrity with a round face shape, Isabella Rossellini a round face shape can be gorgeous with the right hairstyle. So Katie, toning down the volume of your hairstyle is a good start. I agree, that straightening it everyday, with a flat iron, or whatever tool you choose, will take it’s toll on your hair. The stripe-y effect you refer to, IS more exaggerated when your hair is in it’s curly state because curly hair CLUMPS together into curls. When your hair is straightened, it has a more BLENDED effect; as you brush through it to take out snarls for instance. Try searching for a hairdresser who has experience with straightening hair, and consider softening your curls. The key here is, in the straightening process, to process your hair to a softened state, not a stick straight look. An experienced hairdresser can soften your hair just enough to take out the volume you now get from the curls, and turn it into soft waves. This leaves your hair in much better condition than straightening all the curl out. In that way, you have an option of leaving it wavy or smoothing it out with less damage, less heat on the hair. And, both of these looks will tame down the voluminous look of your hair which is the wrong look for your face shape. Check out my web site for more on face shapes and hairstyles I have a special section just about hairstyles for round faces. And don’t miss or more ideas about face shapes and hairstyles check out our Pinterest Hairstyles for Face Shape Board. Coloring your hair? What about eyebrow coloring? May 30, 2012 By: Barb Quinn Hairstyle Blog Leave your comments (12), Your input matters. Thanks for your comment! For more great tips check out the article Slimming Haircuts for Round Faces. I think that you’ll really enjoy it! I have a round shaped face and thick frizzy hair. i was wondering what hairstyle would suit my face shape.i washoping to get a side fringe. Any Suggestions? Thank you all so so much for the help. I’m planning on having my hair done for an interview I have next week and I was looking online for ideas! HELP 55 yrs old, short heavy thick wavy/curly hair, gray is coming in heavy, borwn is natural color. Just shorter than chin right now with layers, what would be best let it grow or what short style? Hi I’m young and have round face, but my hair is curly and as I study medicine I do not have time to straight it up so what hairstyle do you reccomend? Hi I really hope you can help me out with this! I have a round face and very fine, thin, straight hair. I also don’t have alot of volume, so my hair always appears flat. My hair won’t hold a curl very long without alot of hairspray, so I don’t curl much. It’s also a challenge to tease my hair for volume because sometimes I can’t seem to make it look natural and stay. Pulling my hair back is a no-no because my hair is so fine and thin it really emphasizes my cheeks, so I’ll usually just stick with a side-part, varying how off to the side it is, and I recently had some bangs cut in that I side-sweep, and they seem to flatter pretty well. However I’m getting very bored with my hair. It’s getting pretty long again and my color is all natural (very few natural highlights) and pretty much the same length, and so I’m curious to know some ways to add some volume, fullness, color, life, etc. to my hairstyle. Thanks so much!